Pathfinder is one of the best selling tabletop RPG's around. 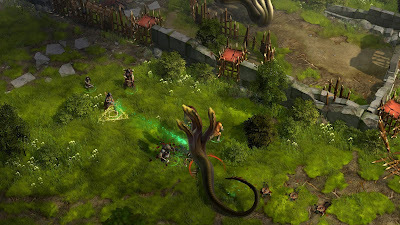 It was built on the Dungeons and Dragons 3.5 system and has since become D&D's biggest rival, so now that Owlcat have picked up the rights to release their very own version of the game (in the form of an isometric RPG), is this version of Kingmaker worthy of your time, or simply an adventure best left at the table? To begin, Kingmaker is Paizo's sixth adventure path - A pre-written adventure spanning 6 books. The idea is you've been tasked to retake the Stolen Lands (fitting name), where you will eventually form your own kingdom. In the pen and paper version there are a number of roles you can eventually take to give your character a more important role within the story. Roles vary from Spy to General, Grand Diplomat and even King or Queen, depending on your gender. You see, Owlcat have consolidated a large amount of spells and schools of magic, which in my opinion actually lessens the experience and greatly lessens the effectiveness and purpose of all Enchantment spells, practically neutering every Enchantment build you can think of. I built Lelouch as a mind-controlling Cleric and due to the issues this caused, he became more just your standard healer. Command and Murderous Command don't exist in the game and Charm Person seems to be missing also. You do get the Charming Smile ability from the Charm domain, but whenever I've tried to use it, it says I have 0 uses left regardless of how many times I rest to get all of my spells and abilities back. I haven't worked out if this is a bug or if there's something else to it, but on the plus side you do still get Hold Person and at level 9, Dominate Person. If I knew this was the case, I'd have made a completely different character at the start of the game, but having said that, even on normal difficulty, it's so hard that I likely wouldn't have survived without maining a Cleric. Character customisation is probably the biggest disappointment here however. For a game where character creation sets you apart with so many choices to truly individualise your character, it really lacks in Owlcats release. 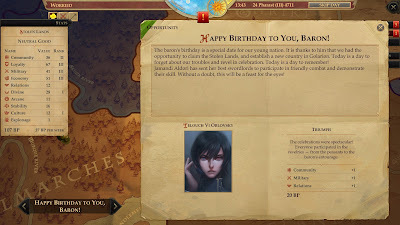 You don't get the background or campaign traits you would in a standard Adventure Path and you don't get to be a Noble from one of the pre-existing Noble families in Brevoy, so running around as Lelouch Vi Orlovsky was completely meaningless when I met other Orlovsky's in the story. All characters (but mine...) are only ever addressed by their forename, so seeing my characters full name in every piece of text is a little silly. Again though, this is something you only really discover through playing, after you've begun your adventure. The visual appearance of your character really doesn't vary much either, so you'll end up with a character who looks nothing like what you'd envisioned. Thankfully you do get the option to upload your own character Avatar, so it's not completely terrible. One of the many Kingdom Building events, featured within the game. The game itself does play a lot like the pen and paper version. The game mechanics are all stat-based with a lot of dice-rolling going on in the background. As such, even with the highest abilities you're not always guaranteed success. Naturally the margin for failure will lessen, the better the gear you have, but knowing this you'll be on the lookout for upgrade after upgrade. I've racked up 80+ hours since being given the game for review and am still only on chapter 3 with a party of six level 9 characters. As such, it's unclear as to how many chapters are actually in the game, but if Owlcat have remained true to the book, the game should have 6 chapters, which means I have a long way to go. Pathfinder: Kingmaker is absolutely brimming with content. There are so many locations to visit, plunder and explore that it's impressive. With every cave or new area, there's always a sense of mystery because you never can tell what awaits you on the other side. 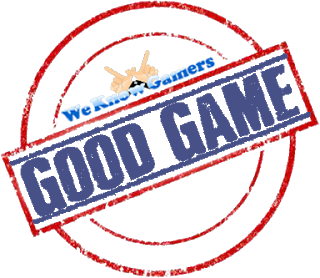 At earlier levels the game is absurdly hard, but the stronger you get, the better gear you collect and the more you familiarise yourself with the characters, you'll find the difficulty will drop considerably, offering you a much more manageable experience. Next up we have character classes and though many are missing, there's a lot on offer, each with several archetypes to choose from. Don't expect to see anything from the Advanced Class Guide or Occult book here, because you'll be disappointed. Instead, the options available are mostly a mixture of the Core Rulebook, the Advanced Players Guide and both the Ultimate Combat and Ultimate Magic books. Prestige Classes are also an option here and can make your character a little more diverse, so you should expect to see the Arcane Trickster, Duelist and Eldritch Knight, because they all made it into the game. A big difference between this version and the tabletop version is that the tabletop game is turn based, where as this relies on a system where you're constantly pausing and resuming gameplay to select which spells and abilities you want to use against your opponents. At first I was unsure if this would be any good, but after growing accustomed to the way it works, it's actually quite nice being able to pause and think about things in some of the tougher fights you'll face. This game does have a fair amount of flaws, however, one of which being the annoyance of micro management thrown upon you. A good example of this is if you have multiple potions in your inventory, you can assign a certain number to each character, but should they run out, their individual inventory will still show the potion icon telling you they have 0 left, but won't automatically load them back into their slot from the menu. This just made their potion icons pointless in my opinion and made things a lot more arduous than they needed to be. Additionally, you'll be exploring a lot, but you'll also need to sleep regularly and visit the capital fairly frequently. Now, that's all well and good and when travelling to the capital, you're even given the option to teleport straight into the throne room, but should you wish to go there and just drop your excess items off before leaving again, there's no fast travel out, meaning you'll have to leave the throne room and run through the town every single time you want to do this. If that wasn't bad enough, there are three rather long loading screens you'll need to sit through every single time you go into the throne room, leave the throne room and leave the capital. Every time you boot up the game there's another 3-4 minute loading screen. There's even a loading screen just to bring up the kingdom management screen. Pathfinder: Kingmaker is absolutely plagued with loading screens. Interestingly, I can run The Witcher 3 and Nioh on the Very High graphics setting and they hold up on my PC without an issue, but this game, which isn't all that demanding graphically, will often crash or freeze, yet still allow me to click around in the background. Essentially the game is still functioning as it should, but the display isn't. Though, you just need to browse Google or Reddit to see the amount of issues people have with this game. 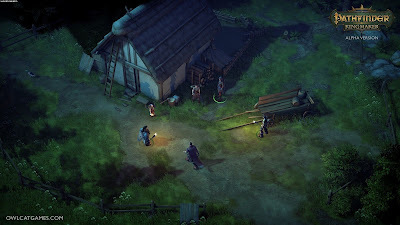 It's frustrating, because without the bugs, I'd go so far as to say Pathfinder: Kingmaker is a great isometric RPG. 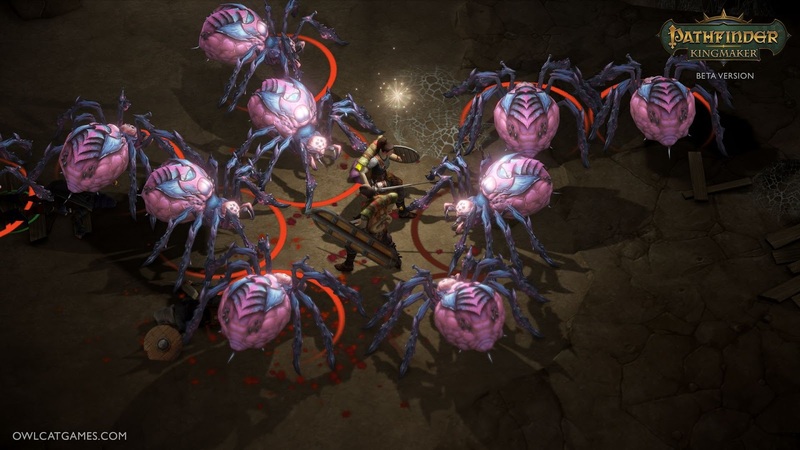 Pathfinder: Kingmaker is mostly true to the pre-written adventure path and features many of the main (and side) quests of the pen and paper version. This is great for fans of the latter, because it means we all get to see these events unfold in a 3D environment, as our character fights alongside Paizo's very own iconic Kingmaker characters. Of the true iconic heroes, only Amiri the Barbarian appears to be a party regular, but you can still fight alongside Kesten Garess and Jhod Kavken. You also get to select your party members every time you leave the capital, but be sure to give your created character a good build, as they're the only character you can't swap out. Though the first chapter is incredibly tough (even on normal difficulty), it's not until you reach chapter 2 and step into the kingdom building segments of the game that you realise how good Kingmaker can actually be. The trouble is you'll have to spend the 30 or so hours it takes to get there before you can see this for yourselves, and on top of that the game puts you on a 3 month in-game timer as soon as you begin, which I found to be a little stressful. From chapter 2 onwards this isn't really an issue, but you will still have quests you'll have to frequently send your advisors out on, if you're to earn the BP needed to keep your kingdom functioning, along with quests to boost loyalty, community and military power as an example. Thankfully though, you can assign an NPC to one of these tasks and still take them out on missions as a main member of your party. Just be sure to visit the capital regularly, because the last thing you want is a game over screen from failing your people as your kingdom dissolves into nothing. My Kingdom is pretty healthy, so I haven't had to worry too much, but it is something I highly recommend keeping tabs on. When you've passed enough missions to start taking over the surrounding lands, the gameplay opens up even further, as you're able to start building a shrine, tavern, brewery etc. These all go towards your kingdom stats and as soon as you've taken over a total of three different regions, you're able to upgrade your barony into a town, with the eventual goal of turning it into a city. You must meet with an advisor who represents a certain kingdom stat for every 20 points you have in order to upgrade your rank. This usually takes 14 days in-game, during which time other missions can pop up and disappear before you've even reached the end, so you really do have to be careful when you choose to do this. Also, an advisor can only be assigned to one task at a time, so prioritising the more important tasks is a necessity. I'd advise making every single one of your party members unique, so you have more of a reason to keep them around. For example, Amiri in my party is great at Athletics (they consolidated the skills, so things like Climb or hopping over a tree trunk would come under this), Linzi (a Bard central to the plot) is great at Mobility (balancing on logs that cross a ravine etc) and my primary trapspotter. My main character is really good at healing and has some control spells and buffs to aid the party. Then I have Ekundayo as my main Archer (he's really good at it), Jubilost for crowd control (he's an Alchemist with bombs) and Valerie as my wall (she's a Fighter in Full-Plate Adamantine armour with a ridiculously huge Tower Shield - She also pairs well with Harrim - a Dwarf obsessed with Death). Octavia is also an archer but instead of a Ranger like Ekun, is a Rogue/Wizard cross-breed, so again she brings something different to the party when I swap her in. If you can get past the opening chapter, there's an incredible amount to do in Pathfinder: Kingmaker. Where character creation may be lacking, you still have enough options to create a fairly unique character of your own (at least where abilities are concerned), and though there are many flaws in the system and even game-breaking bugs where quests don't load or finish properly (be sure to have multiple saves to get around this), Kingmaker still manages to remain a good game - Every party member has their own unique personality, made memorable with some fairly entertaining voice acting, and with so many dialogue options, paths to take and moral choices to make, Pathfinder: Kingmaker is a really good game. It's just not a great game. The only things stopping it from being great are the bugs and design flaws, which is a massive shame, because I feel this will prevent a lot of people from purchasing an enjoyable game, which, with a little more work could have been something great. Got something to say? Let us know in the comments below or hit me up on twitter @CaptainCortez.